Those cache sizes are sometimes referenced when a cache doesn’t have a specific size setting. The Language Fallback has a cache containing the validity of a fallback field. Essentially it just stores a boolean, “1” or “0”, for each entry in this cache. There is a cache for each database, so the name of the caches is “dbname[isLanguageFallbackValid]”, and its size is hard coded to Small cache size in DatabaseCaches.Initialize(). One would think that this wouldn’t be a problem. If we’re caching just a true/false value, wouldn’t 100KB be enough? Well, it turns out that behind the scenes, this isn’t performed in a very efficient way. The cached value is dependent on multiple parameters, making the cache key quite complex and large in size. In the Sitecore implementation, it uses a specific IsLanguageFallbackValidCacheKey object to describe the key. It contains the Item ID, the Field ID, the Language and, for some strange reason, the Database. (The cache is per database anyway). In addition, the Item ID and Field ID is converted into strings. A Guid is 16 bytes in size. A Sitecore ID.ToString() becomes 38 characters, and a character in Windows is two bytes, so this 16 byte Guid suddenly becomes almost 80 bytes. So there is a lot of room for cache key size reduction here. 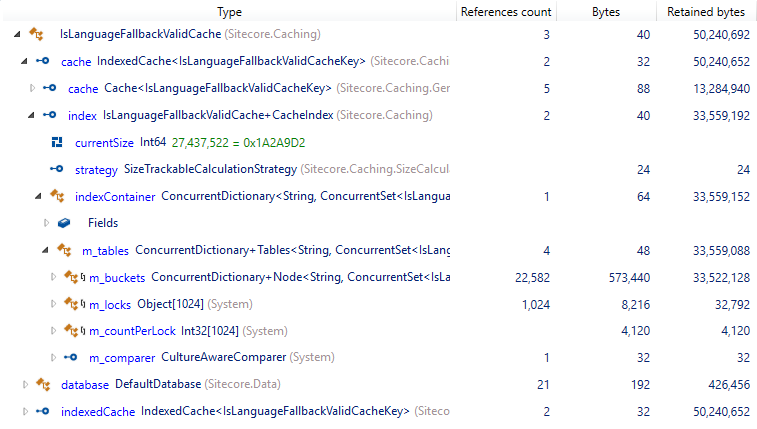 The cache itself also of a “Indexed” cache type, so that gives a lot of overhead as well. As lists, hash tables etc grows, they also pre-allocate space for future objects. The sum of all this is that an entry in this IsLanguageFallbackValidCache is almost a kilobyte each. So essentially only about 100 entries or so will fit in the cache. You probably have something in the magnitude of 100,000 field values in your solution if you find Language Fallback useful. 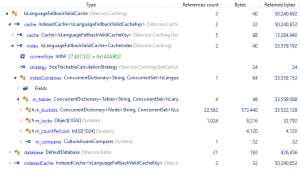 Look at the size of the cache in /sitecore/admin/cache.aspx and look for cache clear warnings in your logs to find a good balance that suits your solution. A potential downside is that all other caches that use the “SmallCacheSize” is also changed. I’ve filed a wish to Sitecore to have a unique cache size settings for each cache and just use the pre-defined small/medium/large cache sizes as fallback. When writing this, I have an open ticket on this too, and I assume Sitecore will come to the same conclusion that the cache key objects needs to be rewritten to reduce its memory foot print and the default size should be set to something like “MediumCacheSize”. Thank you so much for posting this Mikael! That (probably) solved a strange issue we had where images were not rendered in the CMS on language versions using fallback!